From deserted fields and dark forests to murky rivers and concrete jungles, environments can leave traces of physical evidence on a criminal. This principle has been well known to crime scene investigators (both real and fictional) since the the late 1800s. However, figuring out what the most reliable pieces of evidence are – and how to best detect and analyse them – can be difficult. Microscopic algae, such as diatoms, can be picked up from virtually anywhere there is water – including seas, lakes, soils, some domestic water supplies and even moist surfaces such as exposed rocks. While diatoms traditionally have been used to diagnose death by drowning, research is unravelling their huge potential for use as trace evidence in a range of forensic investigations. Diatoms appear golden brown to the naked eye. However, when seen under the microscope, they display a beautiful range of shapes, colours and ornamentation. There are estimated to be more than 20,000 species worldwide. 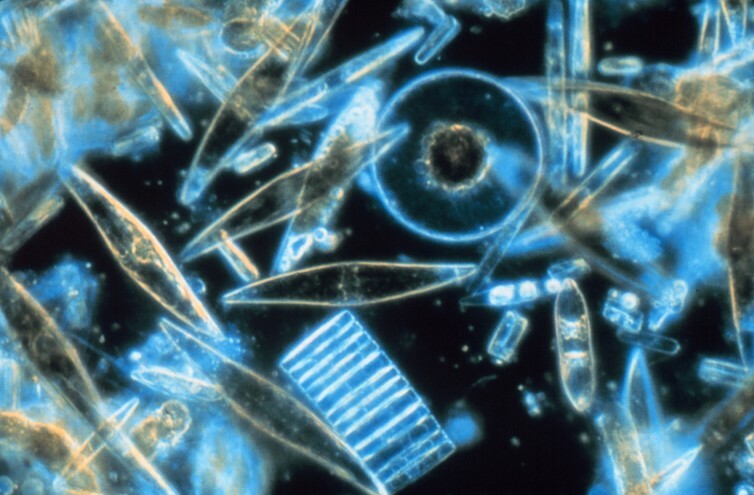 Diatoms are composed of silica – recently found to be the strongest natural material on the planet. Although most forensic investigations are carried out on dry land, roughly 71% of the Earth’s surface is covered in some sort of water. Such marine or freshwater environments are often encountered as crime scene locations or sites of accidental death, suicide and natural or civil disasters (including plane crashes). Even when a crime is carried out on land, water scenes may be used by a perpetrator to dispose of any incriminating evidence. Diatoms are useful when diagnosing drowning as a cause of death. Their microscopic size and presence in standing and flowing water means they are often inhaled and swallowed during drowning. They are then transported throughout the circulatory system, and deposited in various organs including the lung, brain and bone marrow. Diatoms can be observed under a microscope after a post-mortem examination. They can then be compared to the diatoms in the water where the body was found. If diatoms are not present in the body, it may mean that the victim didn’t die by drowning after all. If the diatoms in the organs are significantly different from those in the water in which the body was found, it may mean that the victim has been deliberately drowned elsewhere and then moved to a second location in order to make a crime look accidental. Although widely used, the accuracy of the diatom test for drowning is highly debated among experts. It is generally agreed that diatom analysis can provide important evidence of drowning, but should be used alongside other independent techniques within forensic pathology. Research has also demonstrated how diatoms can be used to estimate the time since death – a crucial piece of information in any forensic investigation. This is notoriously difficult to do in water, with scientists often drawing conclusions based on the body’s level of decomposition and the presence of insects and bacteria. In one study, scientists examined the accumulation of algae over time on animal remains as a proxy for humans. The diversity of algae on piglet bodies in water tended to decrease over time with a peak in diatoms recorded after 1-8 days of decomposition. This kind of work remains largely experimental, but it has potential to be used for establishing a timeline since death (or submersion) in water. Diatoms are also showing promise as trace evidence indicators. The concept that criminals often unknowingly pick up traces from a crime scene while leaving their own behind, has already led to the forensic examinations of materials including dust, paint fragments, hair, fibres, soils, bacteria and pollen. The reason diatoms are so useful in this regard is that they are so abundant in so many different environments. Microscopic assessment of diatoms found on clothing, footwear and personal belongings have already provided evidence in cases including homicide, serious assault, and serial burglary across Europe and the US. For example, in 1996, a female victim was recovered from the Hudson River, in the US. A post-mortem revealed that she had been drugged and strangled, before being drowned in the river. Diatoms recovered from the victim’s bone marrow were different from the water supply at her home but could not be ruled out from the scene of the crime. During the investigation, diatoms collected from the suspect’s wallet and shoes provided a link to the drowning site, helping to solve the case. However, despite this initial success in case work, there are relatively few forensic diatom experts worldwide. As a result, diatoms are less frequently studied as trace evidence than pollen and soils, for example. To fully realise their potential in forensic science, more research will be needed. It is important to know how to collect any adhered diatom evidence from clothing, for example. Research has investigated the exact mechanisms by which diatoms stick to cotton clothing – in both water and soil – and how to get them off so that they can be used as evidence. The results highlighted that treating clothing with hydrogen peroxide was effective. If the diatoms are not isolated in this way, other biological material on the fabric – such as other algae or pollen – can make it hard to properly identify them under a microscope. The field of diatom analysis in forensic science is very much emerging and has considerable potential for further research and application in case work. The stakes are high. Aquatic systems are complex and notoriously difficult for forensic scientists to analyse, so using diatoms as a reliable tool would have a huge impact for crime scene investigation.